As we all know the government is making major cuts across all industries, communities and schemes to try and improve the current state of the economy, so it doesn’t come as much of a surprise that the Feed-In-Tariff (FIT) on Photovoltaic solar energy production is being reduced. 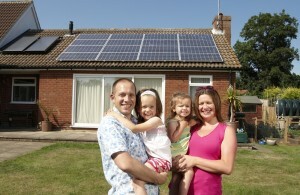 As of August 1st 2011 there will be a new tariff put into place for large scale and stand alone solar schemes. The announcement was made on Thursday 9th June after a recent public consultation about future schemes, which closed on the 6th May. The decision to reduce the current FIT is to protect the money available for small scale projects and the range of technology supported under the scheme. No-one could have predicted how well the scheme worked, with lots of large scale projects popping up across the country. For every large scale solar scheme producing 5MW it will cost £1.3 million per year, 20 of these installations in a year cost £26 million, which then prevents 25,000 PV installations on our homes. However, it is not all bad news!! IF you get an installation finalised before the 1st August, you will lock in the current rate of 43.3p kWh, instead of the reduced future tariff of 19p kWh! It will be money well spent, especially at the minute with the amount of sun we are having through this drought. If your solar panels are producing less than 50kW you will also be unaffected by the change in FIT. So, what are you waiting for? Get a quote quick before it’s too late! Anglian Home Improvements raising the standard since 1966. Visit the Anglian website for information on our photovoltaic solar panels.